Remaking a World completes a triptych of volumes on social suffering, violence, and recovery. 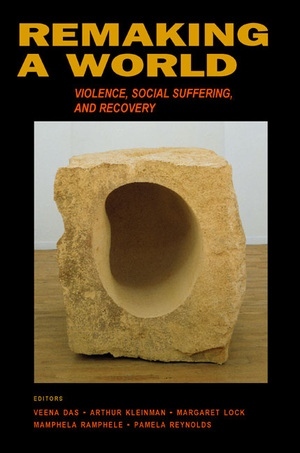 Social Suffering, the first volume, deals with sources and major forms of social adversity, with an emphasis on political violence. The second, Violence and Subjectivity, contains graphic accounts of how collective experience of violence can alter individual subjectivity. This third volume explores the ways communities "cope" with—endure, work through, break apart under, transcend—traumatic and other more insidious forms of violence, addressing the effects of violence at the level of local worlds, interpersonal relations, and individual lives. The authors highlight the complex relationship between recognition of suffering in the public sphere and experienced suffering in people's everyday lives. Rich in local detail, the book's comparative ethnographies bring out both the recalcitrance of tragedy and the meaning of healing in attempts to remake the world. Veena Das is A. Krieger-Eisenhower Professor of Anthropology at Johns Hopkins University. Arthur Kleinman is Maude and Lillian Presley Professor of Medical Anthropology at the Harvard Medical School. Margaret Lock is Professor of Social Studies of Medicine at McGill University. Mamphela Ramphele is Managing Director of the World Bank and former Vice Chancellor of the University of Cape Town, where Pamela Reynolds chairs the Department of Social Anthropology. In other combinations, these five are also the editors of Social Suffering (California, 1997) and Violence and Subjectivity (California, 2000).